The growing nurse shortage has been in the headlines for years, but there is another very real shortage that’s also affecting our nation…the allied health personnel shortage. Defined as clinical healthcare professionals that assist physicians and nurses, allied health personnel are an important part of the healthcare system. Hospitals, nursing homes and clinics are beginning to feel the stress of the aging Baby Boomer population, as these institutions are seeing the allied workforce retiring in droves at the same time that patient intake is increasing. Given the circumstances, now seems like a perfect opportunity for savvy business owners to develop their staffing agency to meet the new demands. Allied health staffing agencies need cash to cover the costs of advertising, recruiting, and expanding offices. Unfortunately, right now is a bad time for businesses who are seeking ongoing financing because banks have tightened their lending criteria as a result of the national credit crunch. Moreover, the economic decline instigated a jump in small business credit card interest rates in addition to overly-obtrusive credit restrictions on small business owners. 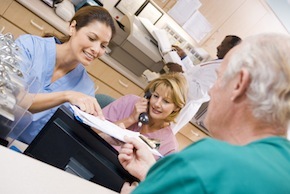 This situation puts allied health staffing business owners in a conundrum. On the one hand, now is a prime opportunity for supplemental staffing agencies to expand, but on the other hand, no one seems to be lending to businesses these days. Luckily, accounts receivable factoring companies are still lending. Factors generally do not require a history of profitability, personal financial statements, business plans or personal guarantees. Because there are fewer documents needed, allied health staffing companies can receive their first funding within 3-5 days of returning factoring documentation. Many factoring firms will not require business owners to sign a long-term contract. In addition, once the staffing agency has been approved, it can stop or start factoring at any time. With bank financing, once a company hits the credit limit, it cannot borrow more cash. Invoice factoring is the only source of business financing that grows with the company’s sales. As sales increase, more money becomes immediately available to the agency owner. Because factoring is not a small business loan, there is no debt, and there are no monthly payments to ‘muddy up’ the company balance sheet. Banks work with all kinds of companies, so they might not be familiar with the intricacies of the industry. There are factoring companies out there who understand the ins and outs of the allied health staffing industry, so business owners won’t have to worry about teaching a factor about their business model. The allied health workforce will continue to play an integral role in the healthcare system as the demand for their services continues to rise. This need presents a great opportunity that allied health staffing agencies can use to their advantage. In order for these staffing agencies to acquire new customers, they will need to hire additional employees and possibly expand their infrastructure. Unfortunately, these staffing agencies also need to accomplish this growth during a time when it has become increasingly more difficult to obtain traditional financing. Fortunately, those allied health staffing agencies can use factoring as a flexible financing solution to the cash flow problems that can arise during periods of growth. Philip Cohen is the founder and president of PRN Funding, LLC, which is an extraordinarily focused niche player in allied health staffing invoice funding. Through a process known as factoring, PRN Funding provides allied health staffing business owners with the financial resources needed to grow and effectively compete in the industry. With no minimums or fixed terms, PRN Funding provides staffing companies with flexible and immediate access to capital. Contact Philip Cohen at toll-free 866.776.5407 or via email at pcohen@prnfunding.com. Please visit PRN Funding, LLC on the web at http://www.prnfunding.com. Article reprinted with permission by PRN Funding, LLC.